More on this story from CNN affiliates WOIO-TV, WEWS-TV, WJW-TV and WKYC-TV. iReport: Are you there? Let us know but please stay safe. [Updated at 4:04 p.m. ET] Chardon Police Chief Timothy McKenna said in a press conference today that two of the victims in Monday's shootings were in critical condition, one was in serious condition and one was in stable condition. [Updated at 2:58 p.m. ET] Danny Komertz, a student at Chardon High School said that he saw shooter T.J. lane point a gun directly at a group of students before shooting them. "I looked straight ahead and I saw a gun pointing at a group of four guys sitting at a table and he was able two feet away from them," Komertz said. "He just fired two quick shots at them. I saw one student fall. I saw the other hiding, trying to get cover underneath the table." Komertz said that he felt that by his demeanor, the shooter was targeting that group. "It was clearly to me that he was aiming right at them," Komertz told CNN. "He wasn't shooting around the cafeteria at all. He was directly aiming at the four of them." Komertz said he then ran out the door with his friends. While he was trying to escape he said he heard another two shots fired from behind him. "I just can't believe it. I don't think it's real," said student Danny Komertz, who witnessed the shooting. "And I just, it kills me that I saw someone hiding, and now that someone is now dead." [Updated at 2:13 p.m. ET] A fatally wounded student was identified by the hospital that treated him as Daniel Parmertor. "We are shocked by this senseless tragedy," Parmertor's family said in a statement released by MetroHealth Medical Center. "Danny was a bright young boy who had a bright future ahead of him. The family is torn by this loss. We ask that you respect our privacy during this difficult time." [Updated 1:19 p.m. ET] A student who hid in a classroom at Chardon High School said that T.J. Lane, the suspect in Monday's shooting, "was a nice guy" who he never suspected would shoot anyone. Erasmus said that Lane and some of the victims "used to be friends" but more in middle school and early high school. Erasmus told CNN that he believed T.J. Lane was either a sophomore or junior at the school. He said that Lane was sitting about a table away from some of the victims. Erasmus said he heard the victims "were all sitting there and then he just stood up and that’s when it all started." Meanwhile, he and the other students in a nearby classroom, "turned the lights off and we headed into a corner" after the shooting. [Updated 12:52 p.m. ET] Witnesses and one of the shooting victims have identified the gunman as T.J. Lane, according to The Plain Dealer of Cleveland. [Updated 12:04 p.m. 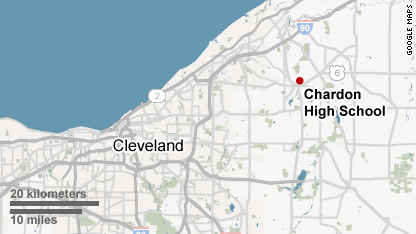 ET] Police say one student has died from the shootings at Chardon High School this morning. Five students were shot in total, officials said. [Updated 11:58 a.m. ET] A parent of children who attend Chardon High School says the gunman in today's shooting had specific targets and was not shooting randomly, according to a report from CNN affiliate WJW-TV. [Updated 11:43 a.m. ET] The federal Bureau of Alcohol, Tobacco, Firearms and Explosives says it has been given one handgun from the Ohio high school shooting scene to do an emergency trace. The Geauga County sheriff's office is executing searches in the case with the assistance of ATF agents, a law enforcement official said. [Updated 11:13 a.m. ET] Geauga County Sheriff Daniel McClelland says a K-9 unit tracked the shooting suspect, who was apprehended "some distance from the school," according to a report on CNN affiliate WJW-TV. [Updated 10:54 a.m. ET] The suspect in the shooting of five students at Chardon High School turned himself in to bystanders in Chardon Township, a law enforcement official told CNN affiliate WKYC-TV. [Updated 10:43 a.m. ET] A student at Chardon High School, Evan Erasmus, told CNN affiliate WEWS-TV that the suspect in Monday's shootings may have posted a threatening message Sunday night on the social networking service Twitter. "I think he said that he was going to bring a gun to school and I think that everyone just blew it off like he was joking," Erasmus said. [Updated 10:34 a.m. ET] Law enforcement officials say they received reports that a teacher chased the shooter at Chardon High School out of the building. [Updated 10:31 a.m. ET] There are five victims of the shooting at a Chardon High School in surburban Cleveland, law enforcement officials said. [Updated 10:05 a.m. ET] Those wounded at Chardon High School in Ohio are students at another school in nearby Auburn, said Evan Erasmus, a student at Chardon. They had been waiting in the Chardon cafeteria for a bus to Auburn when they were shot, Erasmus said. [Updated 9:53 a.m. ET] Four students were wounded when a gunman opened fire in the cafeteria of a suburban Cleveland high school just as the school day was beginning Monday, law enforcement officials said. The suspected Chardon High School shooter - believed to be a student, according to a school official - was in custody, FBI Special Agent Scott Wilson told reporters. Wilson declined to say how badly the injured students had been hurt. "We just hope that they're OK," he said. School administrators locked down schools in the city of Chardon, Ohio, about 30 miles east of Cleveland. and assured parents that all remaining students were safe. Still, parents eager to retrieve their children hurried to school buildings, forming long lines as school officials checked identifications before releasing students. At one point, black-clad SWAT team members walked by parents waiting outside the middle school, enhancing what was a surreal scene for many. "This stuff doesn't happen here at Chardon. Everybody's a little upset," said one parent who was preparing to pick up his daughter, a 10th-grader who had been evacuated to Maple Elementary School. Despite initial reports that two people were involved, it appeared only one person was responsible for the shooting, Superintendent Joseph Bergant said. "My understanding is there was one gunman," he said. Bergant said he believed the suspect is a student. The shooting occurred around 7:40 a.m. just as school was getting started for the day, school board member Larry Reiter said. It happened inside the cafeteria, which is near the entrance to the school, he said. It was unclear how the suspect was taken into custody. School officials locked the high school down following the shooting. One parent told CNN affilaite WKYC that her daughter had texted from a closet to tell her that there had been a shooting at the school, but that she was okay. Chardon is a small city of about 5,100 people 30 miles east of Cleveland. About 1,150 students attend the high school, which is next to Chardon Middle School and across the street from Maple Elementary School. [Updated 9:48 a.m. ET] A youth suspected in the shooting at an Ohio high school fled the building but was caught nearby, according to a Plain Dealer report on Cleveland.com. Three boys and a girl were injured in the shooting which happened in the Chardon High School cafeteria before classes started, the Plain Dealer report said. "Parent Jeannette Roth, who had heard from her son Joshua, a junior, said he told her the shooting happened while students were eating breakfast in the cafeteria and waiting for first period. Suddenly a boy 'stood up and started shooting, and then it was chaos,'" the Plain Dealer report read. [Updated 9:27 a.m. ET] Four students were wounded in the school shooting Monday morning at the high school in Chardon, Ohio, officials said. The extent of their injuries was unknown. [Updated 9:21 a.m. ET] At least three students were injured when an armed individual entered the cafeteria of a high school near Cleveland and opened fire just as the school day was beginning Monday, police and the school superintendent said. School officials said they did not know how badly the injured students had been wounded, but some had been taken by helicopter to the hospital. Police took a suspect into custody, locked the high school down and assured parents that all remaining students were safe. School officials said the rest of the high school's students were being evacuated to a nearby elementary school. Parents gathered outside the school administration building, hoping for information about the incident and how to retrieve their children. "My daughter is at the school and she's texting me saying they're in a closet right now and they're OK," a parent speaking to CNN affiliate WKYC said. [Updated 9:06 a.m. ET] The superintendent of Chardon schools said Monday he believes there was only one gunman involved in the shooting at Chardon High School. [Updated 9:01 a.m. ET] A person who fired shots at a high school near Cleveland on Monday morning is in custody, a school official said. [Updated 8:55 a.m. ET] At least three students were wounded when two people entered the cafeteria of a high school near Cleveland, Ohio, and opened fire just as the school day was beginning, police and a school board member said. The shooting happened at Chardon High School in Chardon, Ohio, Lt. John Hiscox of the Geauga County Sheriff's Office said. Three or four students were hit by the gunfire, said Larry Reiter of the Chardon Schools Board of Education. He did not know their conditions, but said helicopters had been called to take the injured to a hospital. [Updated 8:43 a.m. ET] Two shooters entered Chardon High School and and shot three or four students in the cafeteria, school board member Larry Reiter told CNN. He did not know their condition. [Posted 8:38 a.m. ET] A shooting has occurred at Chardon High School near Cleveland, Ohio, Lt. John Hiscox of the Geauga County Sheriff's Office said Monday. I cherished as much as you will obtain carried out proper here. The sketch is tasteful, your authored subject matter stylish. nevertheless, you command get bought an nervousness over that you wish be handing over the following. ill indisputably come further before again as exactly the similar nearly a lot continuously inside case you protect this hike. Can I simply say what a reduction to seek out someone who really is aware of what theyre speaking about on the internet. You definitely know the right way to carry a problem to mild and make it important. Extra people have to read this and perceive this side of the story. I cant believe youre no more well-liked because you positively have the gift.